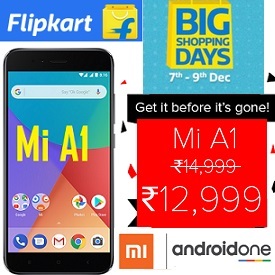 Buy Xiaomi Mi A1 at a jaw dropping discount of Rs.2000 at Flipkart Big Shopping Days. The mobile will be available at Rs.12999 (or at 11,700 if you pay with SBI Credit Card) only for three days from 7th to 9th December 2017. The mobile is available in three colour variants: Rose Gold, Black and Gold. For the very first time, there will be Rs.2000 off on Mi A1. Instant 10% disocunt on SBI Credit Cards. The sale is on. Plus you can exchange your old smartphone to get some more discount. Users can get Buyback Guarantee at Rs. 99 only. So, are you buying? Because it cannot get any better than this. Select your smartphone for exchange to redeem exchange offer. If you pay with SBI Credit Card you will get extra 10% instant discount. Then you will have to pay only Rs.11,700. Android One Smartphone – with confirmed upgrades to Android Oreo and Android P.